Over the weekend of 26-28 June, the UK’s leading organisation for Volkswagen Polo owners once again staged its annual gathering. Previously called the ‘Polo Show’, for 2015 the name of the event was changed to more reflect its status and nature, being more of a social meet-up than a full-blown ‘show’ in the traditional sense. Whatever the name, it didn’t deter Polo owners from all corners of the UK descending on Billing Aquadrome in Northamptonshire for three days of Polo-based antics. With a Show ’n’ Shine on the Sunday, we made our way to the event to present the PoloDriver.com trophy for what we thought was the best car at the show. Shane Biggs’ 6N2 GTI was awarded the prize. Eight trophies in total were up for grabs, with four (1st, 2nd, 3rd best cars in show and ‘People’s Choice’) awards chosen by the event attendees. Club Polo organisers chose the ‘Best Wheels’, ‘Best Interior’ and ‘Best Rat’ winners. A relaxed and informal atmosphere is one of the nice things about the event, and as usual, there was a nice mix of older and newer cars, though sadly no Mk 1 Polos made the event in the model’s 40th anniversary year. To find out more about Club Polo or to join, visit clubpolo.co.uk. Sunbury, UK-based carburettor manufacturer Webcon has reintroduced its carburettor kit for 1043cc-engined Volkswagen Polo and Derby models, built from 1981 to 1985. Priced at £183.75 (€253.58) plus VAT, the kit features a genuine Spanish Weber replacement carburettor for cars originally fitted with the Solex 31PIC7 part. The new item’s part number is 1527075000. The new item has been designed to fit the original manifold and air filters, and is supplied fully jetted for the engine with no additional tuning needed. Also included is every bolt, nut, washer and gasket for the job, as well as comprehensive instructions. Webcon says, ‘If you can carry out basic home DIY maintenance on your car, then you will easily be able to fit a Webcon replacement carburettor kit’. The replacement kit is available from Webcon direct or from one of the company’s appointed worldwide dealers. For further information, contact Webcon on +44 (0)1932 787100 or visit www.webcon.co.uk. 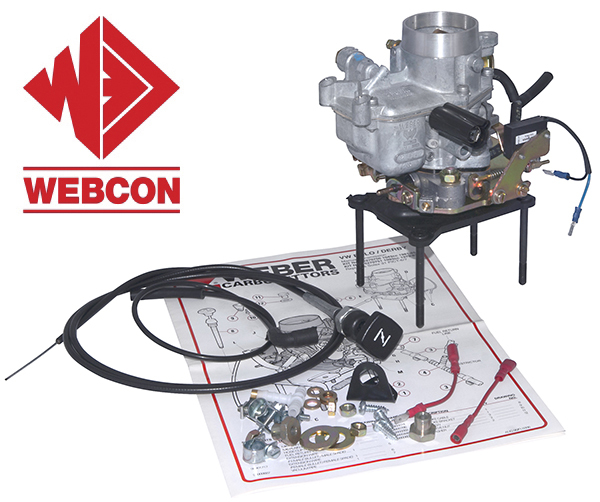 Webcon is a long-standing manufacturer of carburettor systems and has used the same engineers since 1978. The company states that ‘every kit produced is designed to return your car to factory levels of performance’. It’s not just the sporty Polos which are coveted. David Peters from South Devon spotted ‘Barry’, a 1984 Volkswagen Polo C for sale on a classic car website and just fell for ‘him’. A one-family-from-new car with a genuine recorded 56,000 miles, the Irish Green Polo had been garaged all its life and only used for short trips. ‘“Barry” was located in Swansea. It was a long way from south Devon but I had to have him. He was completely original and the family still had the brochure and original receipt of sale plus the dealers keyring and original number plates,’ David recalls. ‘When I went to see him, although he was completely original he was very dirty and in need of some TLC. He drove all the way back to south Devon in holiday traffic – which took 5 hours – smoothly and with no issues at all,’ he continues. David’s plan was always to make sure ‘Barry’ stayed completely original and standard, and with nothing added that was not available as a factory option, as well as no aftermarket additions. The first thing David did was to strip out the interior and seats and give them a deep clean. The four-speed base-model Polo had three missing mud flaps, however David managed to find an original set still in the packaging from an online Polo forum. He also sourced a set of original mats and the search goes on to find original parts to replace the worn ones. David says that the major facelift for ‘Barry’ was a total respray as the paint work was too far gone to salvage. Repainted in the original Volkswagen colour of Irish Green, David has yet to find another Polo in the same shade. 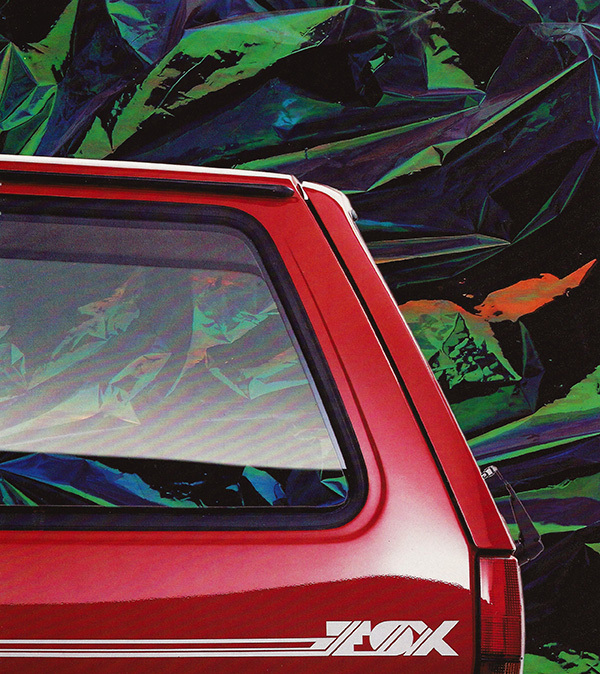 We certainly think it’s rare, and, as it turns out, is also the colour used on the Polo on the front cover of the Haynes manual for the 1982-1990 models. The one addition which David has been searching for since he took ownership is an original set of headlight washers, which were fitted to contemporary Polo GL models. He finally sourced a pair from Poland and is very much looking forward to finally fitting them. David is looking to keep ‘Barry’ for quite some time. And in that period, he fully intends to give the car the love and attention it needs. ‘Barry has recently come out of winter storage and I am looking forward to taking him to as many shows and events as I can,’ David says. ‘Future plans include the stripping and cleaning of the underneath (with every nut and bolt done) plus an engine rebuild to take “Barry” back to as close to showroom condition as possible. I will also keep sourcing rare and genuine parts as well as factory extras,’ he continues. In a sea of modified and ’slammed’ cars on the Volkswagen scene, we at PoloDriver.com applaud David’s dedication to return ‘Barry’ to ‘his’ previous as-new state and leave it at that. A genuine car from its steel wheels to its rare factory sliding steel sunroof, basic ‘Barry’ is a breath of fresh air. Young drivers might not see it, but the show scene needs more cars like this, historical documents, and proof of Volkswagen’s past. 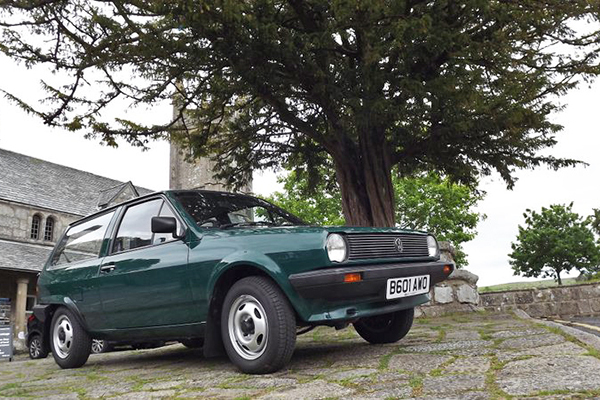 Its success was built on by cars like this little green 31 year-old Polo, but so many are pilfered for parts or lowered to an inch of their wheel arches. Staying standard is the right thing to do with this car. David, we salute you. 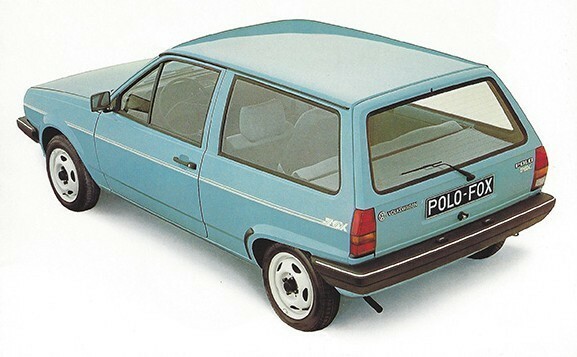 Discover more about the history of the Mk 2 Polo in our heritage pages section here. Visitors to the Techno Classica classic car show in Essen, Germany from 15-19 April will see seven very special Polos celebrating four decades of the popular model. 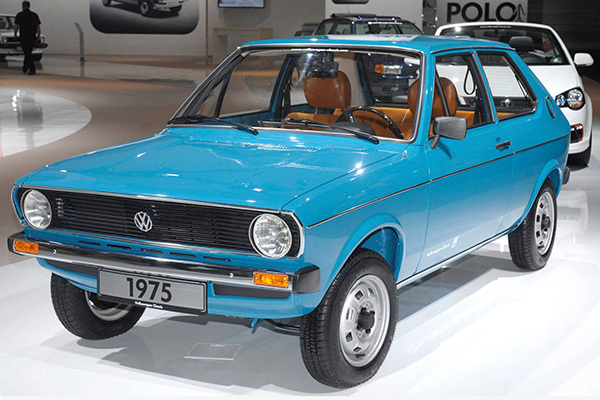 Volkswagen Classic will showcase the versatility of the Polo and mark its 40th birthday with a host of special brief talks, guided tours and promotions. The ‘40 years of the Polo’ exhibition will feature landmark Polos from the model’s past, both series and prototype cars. Noted experts and Polo fans from the VW Polo IG Deutschland e.V. club will give the exhibition extra appeal, with knowledgeable guided tours and brief talks in a specially-designated area. 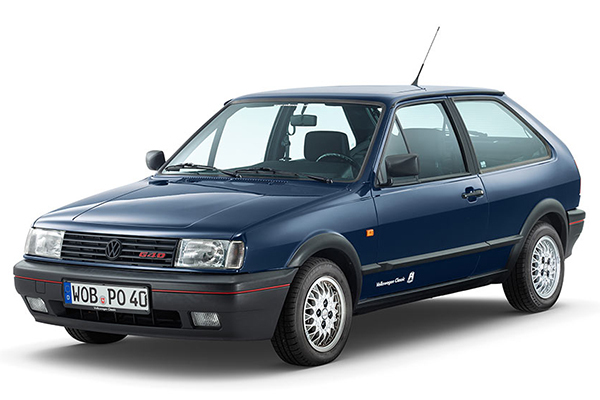 Volkswagen Classic says that subjects talked about will range from the Polo’s model history to its motorsport background, as well as technical highlights such as G-Läder or Formel E versions. The popular second-generation Polo hatchback will be represented by a special ‘Eco’ model prototype, powered by a 0.9-litre two-cylinder diesel with direct fuel-injection. This maximum-efficiency concept also featured exhaust gas recirculation, a system which opened the clutch and allowed the car to freewheel under its own motional energy, a start–stop system, a G-Läder supercharger, and a semi-automatic five-speed gearbox. 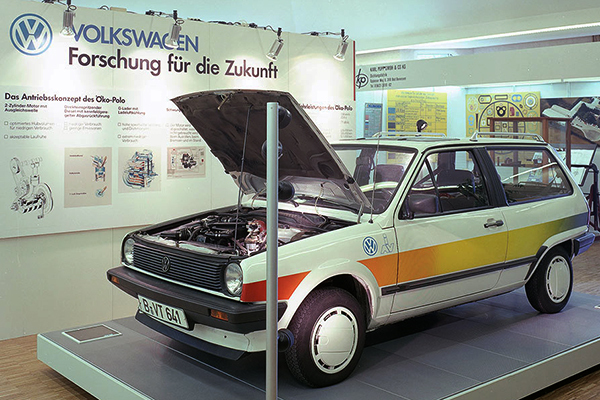 The only surviving prototype from a team of three, this unique Polo has been loaned by the AutoMuseum Volkswagen Foundation. A second-generation coupé, it was used to present the new G-Läder supercharging technology in impressive style in 1985, during a 24-hour world record attempt on Volkswagen’s own test track in Ehra-Lessien. With an average speed of 208km/h, the then record of 168.6km/h in the 1300cc class was shattered. 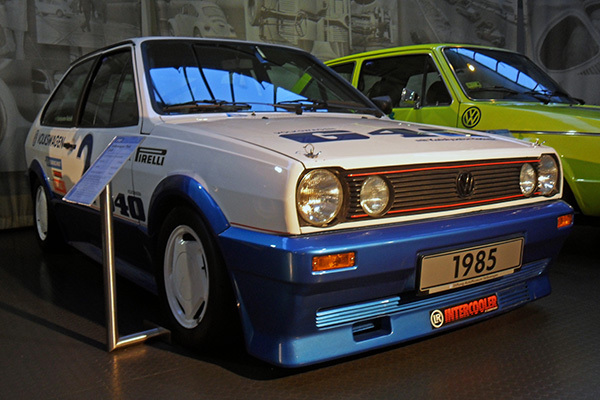 As well as the 1985 prototype endurance record car, a later series production Polo G40 Coupé from 1992 will also take pride of place on the Volkswagen Classic stand. The Windsor Blue car was recently used on the new 2015 Polo GTI press presentation. The third-generation Polo is showcased by a special edition ‘Open Air’ model, which featured an electrically operated folding canvas sunroof. Large enough for even the rear passengers to feel the sun, this car is also loaned by the Foundation AutoMuseum Volkswagen. 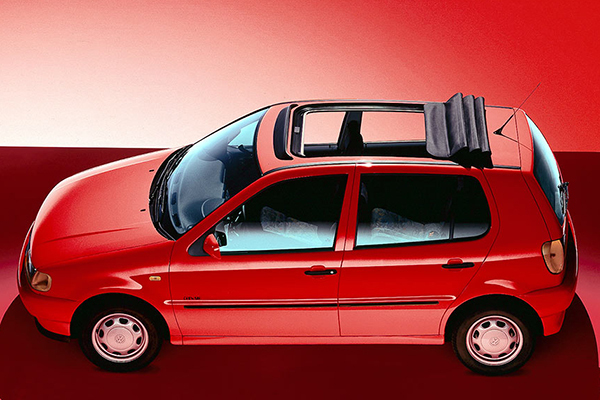 The fourth-generation Polo arrived in 2001, but this car is from the refreshed series which debuted in 2005. 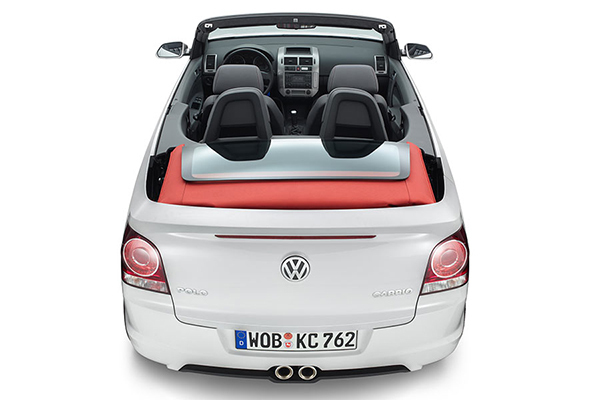 At the 2007 Frankfurt motor show, this car was on the Karmann stand, as the coachbuilder built the concept car to demonstrate its cabriolet expertise. The sloping line of the closed roof gives the Polo GTI a coupé-like silhouette – with an intricate manoeuvre, the open roof disappears completely under the rear shelf. The glass rear window is raised electrically for unrestricted access to the boot. The latest fifth-generation Polo is represented in World Rally Championship trim. 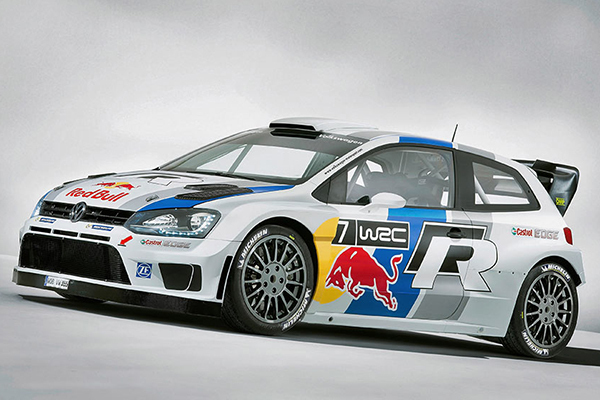 While a concept was shown in 2011, Volkswagen claimed victory in the very first special stage at the Rally Monte Carlo in the Polo R WRC’s debut season in 2013 with Sébastien Ogier and Julien Ingrassia. At the end of the season, both the constructor’s and the driver’s and co-driver’s titles had been secured. The Polo R WRC on display in Essen features both the design and technology of the first championship-winning model. We hope to bring you photos and a report from this amazing Polo get-together. As well as the Essen exhibits, Volkswagen Classic will also feature further Polo celebrations with a comprehensive online special at volkswagen-classic.com with stories, interviews and reports to mark the car’s 40th anniversary.